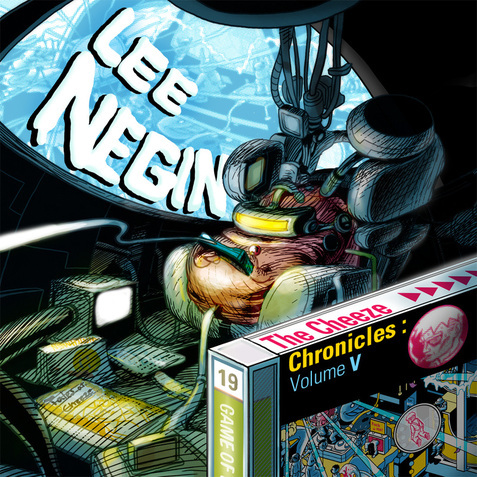 Now based in Seoul, South Korea, Lee Negin was part of the 1980s Detroit techno scene. His latest album, The Cheeze Chronicles: Volume V, is a sci-fi musical radio play of sorts, or what Negin calls a “Technopera”. The story opens with the “Alien Dudes” bidding, “Welcome space cats and kittens, and people of the planet Earth. You are about to embark on a journey that takes place on the stage between your ears”. And from there it’s all fun, freaky and well-crafted studio pastiche electronic mayhem and songs that are like a space crazed blend of 80s New Wave, Neue Neutsche Welle, Kraftwerk and The Residents. Or maybe The War Of The Worlds broadcast meets Carl Stalling on the Planet Gong. Or possibly a Spike Jones collaboration with Hawkwind. The songs are catchy and danceable but never stay still for long. Negin loads on the effects, creating a surrealistic cinema parade of music, sounds and voice samples, with equal focus on entertainment and disorientation. One moment we’re in what feels like an old World’s Fair World Of Tomorrow exhibit, the next a Berlin School space excursion, and then a beat driven space-rave dance floor assault, with a relentless morphing and meteor showering of voices and effects. Following the accompanying Transmission Logue, which is formatted like a script, the story is told by aliens, though it seems to be a humorous commentary on consumer culture, the have/have not divide, and the general silliness we humans are capable of. In the end the aliens bid us a less than optimistic farewell, warning against wasting our lives in childish schemes, admonishing us for self-inflicted pain, to stop judging, and, perhaps most important, to not take ourselves so seriously. For pure fun and tongue in cheek creative coolness The Cheeze Chronicles is the best electronic album I’ve heard all year.